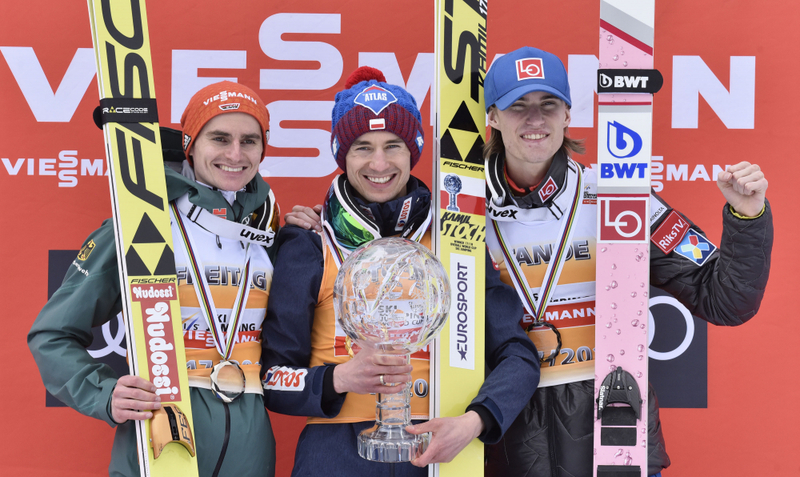 Poland Kamil Stoch won the final contest of 2017/2018 World Cup season featuring only the 31 best ski jumpers of the season. Slovenia was represented by Peter Prevc, Jernej Damjan, Anže Semenič and Tilen Bartol and had one jumper in top ten. The season's overall World Cup winner Kamil Stoch, who clinched the title of the season's best jumper before the Planica event, won his second crystal globe. It was his ninth World Cup win this season and the 31st in his career. He is also the first winner of maiden Planica 7 event that gave extra flavour to the 4- day event and received a prize of 20,000 Swiss Francs. But it was Andreas Stjernen who grabbed the title for the victory in Ski Flying World Cup (257 points) ahead of copatriot Robert Johansson and Stoch (both 250). Pole beat Austria's Stefan Kraft in second and Norway's Daniel Andre Tande's in third place. Stoch managed 245 and 234.5 meters for victory. Best-placed Slovenian Peter Prevc finished in eight place after jumping 235 metres in his first attempt and 232 in his second to finish on 424.1 points. Anže Semenič had the 17th result (20 and 219,5 m). He was followed by his compatriot Tilen Bartol (222and 214.5 m). Jernej Damjan was 23rd (214 and 214 m). ""It was a great season for myself and the entire team. I want to thank every member of our team, without them I wouldn't be here right now. And I also want to thank my wife, my parents, and the fans. We have to best fans in the world."